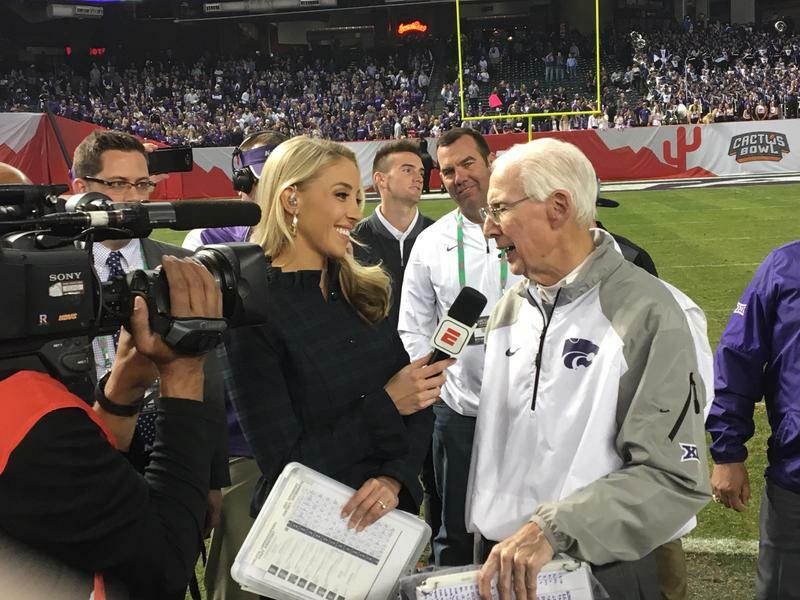 Bill Snyder, being interviewed after Kansas State's victory last month in the Cactus Bowl, says he will return as coach for another season. Kansas State football coach Bill Snyder will be back on the sideline next season. Snyder, 78, had been mulling his future since the Wildcats beat UCLA in the Cactus Bowl last week. Snyder ultimately announced in a brief statement Tuesday that he would return, ending speculation that he might retire for a second time. "As I have stated many times, as long as I remain in good health, am wanted and have a positive impact on the young people in our program, I will continue to be the head coach at Kansas State," he said. "Those factors have not changed, and I look forward to meeting with our players and beginning our out-of-season program when classes resume." Snyder informed his family of his intentions before telling his assistants in a brief meeting on Tuesday, a person familiar with the decision-making process told The Associated Press. The person spoke on condition of anonymity because Snyder did not discuss his plans publicly. Snyder was diagnosed with throat cancer last offseason, but hardly missed a practice. Snyder is 210-110-1 since taking over the program in 1988. "We are excited that Coach Snyder has decided to continue to lead our program and look forward to building off the late-season momentum which included five wins in our final six games, a top-10 road win and Cactus Bowl victory," said K-State athletic director Gene Taylor. Snyder has a contract that rolls over each year, which means he can essentially choose when to walk away. He has said the last several years that he makes that decision on a year-by-year basis, based primarily on his health but also the wishes of his family.